Not sure why it took so long to figure this one out, but here it finally is, a chair dolly that moves both folded and stacked chairs. 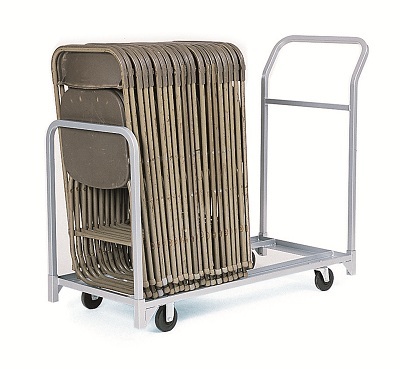 A must for every office building, school or club, the chair tote moves and/or stores both folding or stackable chairs. One push handle, one retaining handle. 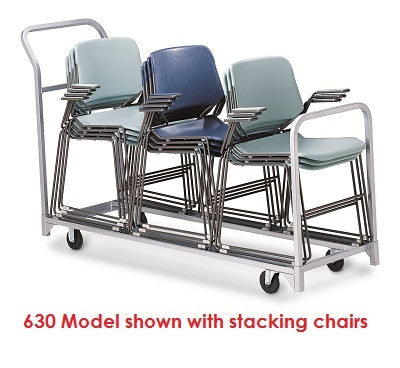 Two models available, the 600 model moves and/or stores 24 folded chairs (allowing 2" per chair) or 2 stacks of stacking chairs, while the 630 model stores 32 folded chairs (allowing 2" per chair) or three stacks of stacking chairs. Overall dimensions: 22" x 50 3/4." Chair rail outside dimension: 21 5/8." Chair rail inside dimension: 13 3/8." Two full swivel, two fixed 4" diameter. Overall dimensions: 22" x 67." We really like this chair rack! It is a very manageable length. Advantages: A length that is easy to move. Disadvantages: I wish it had "crazy wheels" on both ends. The chair cart arrive in a timely manner. No assembly required. Strong and durable, can easily fit folding and stacking chairs. It met my expectations. Helpful customer service and really quick delivery. 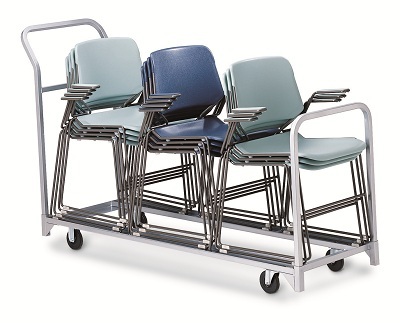 Sturdy cart that accommodates large chairs in either 2 or 3 stacks. 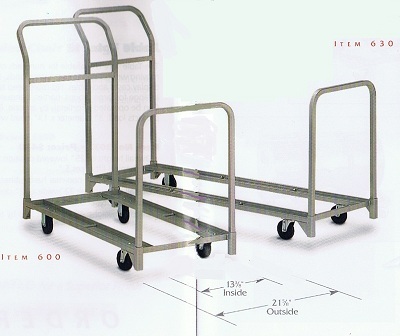 This cart was the exact product I was looking for, the dimensions were perfect and it was well constructed. What will make me buy again is the free shipping; and I'm already looking through you website again.